I know I have not been making many posts lately. While I have been working and having fun with my hobby, my wife and I were preparing for a new addition to our family. We have been anticipating this event for a while and have been making sure that the house is safe and friendly for this new addition. Now that he is here, let me introduce him. Meet Boomer. 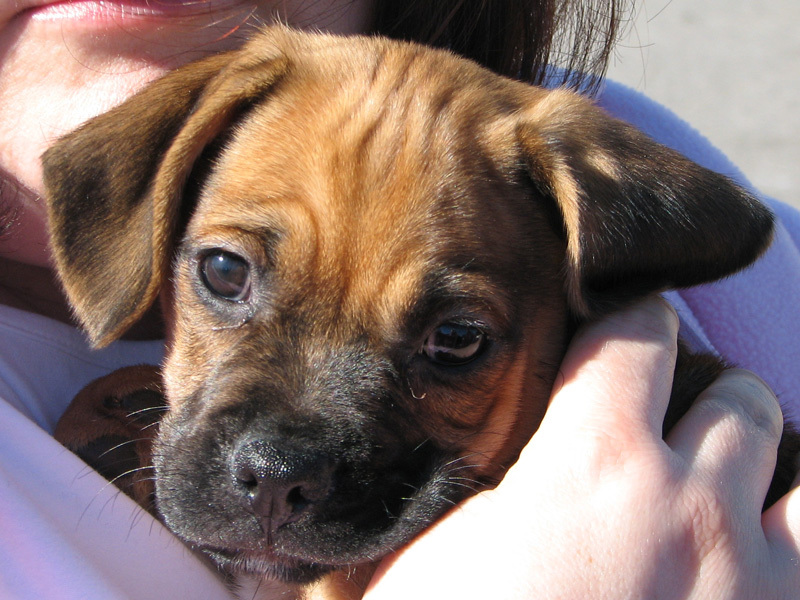 Boomer is a 9-week old Puggle, a cross between a Pug and a Beagle. We picked up Boomer from the breeder in southwest Virginia yesterday. With today being his first full day in his new home, we are getting to see his personality as it is forming. He definitely is showing a lot of his Beagle personality. That will be fun later in the spring at the nearby dog park. But for now, we have to work on his training. He’s only a pup, so it will be both frustrating and fun! If any of the new hybrid breeds are of interest (Puggles, Pekapoo, Yorkiepoo, Cockapoo, etc. ), you should seek out a breeder committed to raising healthy dogs in a healthy environment. You should stay away from breeding houses who just do this because there is money to be made. Do not be afraid to ask questions and make sure you are comfortable with the answers. For us, we found wonderful breeders at Piney Mountain Puppies after seeing a report on a local television news show. Michelle and Fred are based in southwest Virginia and raise a number of hybrid breeds on a large tract of land. So far, Boomer seems to be a healthy and normal pup with all the neurotic actions that come from puppies—which will keep him fun! Thank you for indulging me and I promise to write about something numismatic-related in the next few days!